Authors of selected papers accepted and presented at the conference will be invited to submit their work with extended results in the specials issues of International Journal of Visualization in Engineering. 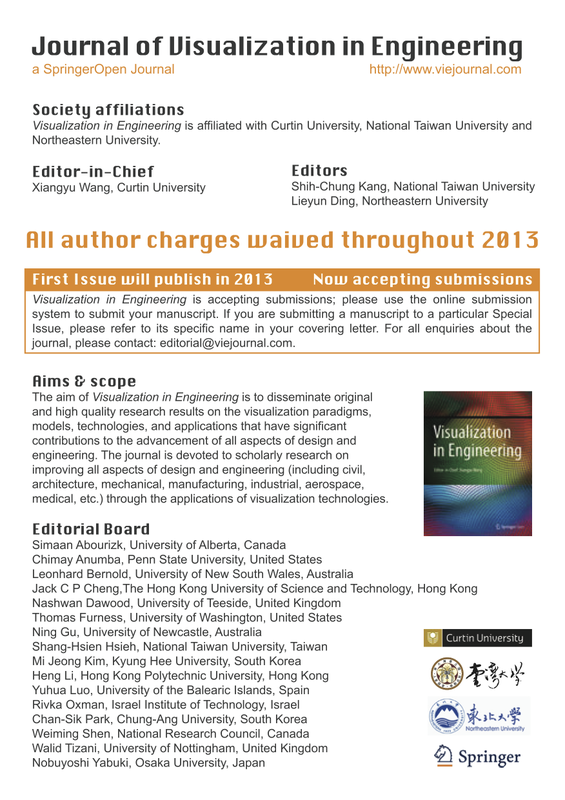 The aim of International Journal of Visualization in Engineering is very close to CONVR conference. It publishes original and high quality research results on the visualization paradigms, models, technologies, and applications that have significant contributions to the advancement of all aspects of design and engineering. The journal is devoted to scholarly research on improving all aspects of design and engineering (including civil, mechanical, manufacturing, industrial, aerospace, etc.) through the applications of visualization technologies. The journal is particularly interested in research that adds to the scientific understanding of the impacts that visualization technologies can have on the stages along the entire life cycle of a particular industry, for example, planning, design, construction, maintenance, and operations of constructed facilities. International Journal of Visualization in Engineering is scheduled to published in 2013 by Springer. Please visit the website for details.